What They Say.....Sensible thirty-six-year-old Sophie Anderson has always known what to do. She knows her role in life: supportive wife of a successful architect and calm, capable mother of two. But on a warm summer night, as the house grows quiet around her and her children fall asleep, she wonders what’s missing from her life. When her husband echoes that lonely question, announcing that he’s leaving her for another woman, Sophie realizes she has no idea what’s next. Impulsively renting a guest cottage on Nantucket from her friend Susie Swenson, Sophie rounds up her kids, Jonah and Lacey, and leaves Boston for a quiet family vacation, minus one. What I Say....After reading the tearjerker, Worthy by Catherine Ryan Hyde, stepping into The Guest Cottage was just what I needed. It was the perfect chick lit beach read. Although, it struck me halfway through the book, this may be leading to my continuing singleness. 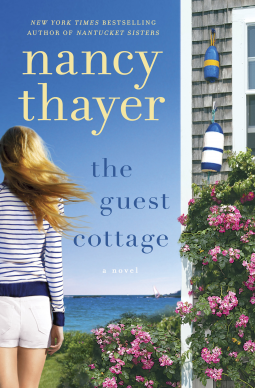 I want to walk into a cottage in Nantucket and find the perfect man waiting for me. It takes all of the awkwardness of online matchmaking, first dates and weird middle aged breakups. It follows the usual pattern, husband who is no longer interested, beautiful wife with wonderful kids, idyllic setting, and hot, perfect man who just walks into your life. I read a few of the reviews on Goodreads that said it was formulaic, predictable, etc. That was a shake my head moment, because it's a Nancy Thayer book. This is what she writes, the kind of middle aged storybook chick lit set in Nantucket. It's what I go to her for. To expect cliffhangers or suspense from Nancy Thayer would be like expecting chick lit from Stephen King. Just accept and enjoy her books for what they are......the reason I'm still single. LOL! !